On 7th April, 2017, LAPSSET Corridor Development Authority (LCDA) launched the Lamu Integrated Investment Framework. The unveiling of the Framework took place during an event that was attended by government officials, Development Partners, Private Sector, the Media and the British High Commissioner (Nic Hailey) as the Chief guest. LCDA, working with Howard Humphreys East Africa supported by the British Foreign and Commonwealth Office developed the Lamu Integrated Investment Framework to identify viable investments and guide infrastructure development in an efficient and sustainable manner, conforming to proper land use strategies and setting up social and environmental safeguards to protect the rich biodiversity in the County and ensure maximum benefits to the local community and nation at large. Lamu county, is among the nine counties that contain key LAPSSET Corridor transport and infrastructure developments such as;- crude and product oil pipelines, Standard Gauge Railways, Highways, International Airports, Resort Cities, Power and Energy Infrastructure, fiber optics and the Lamu Port which is currently under construction. 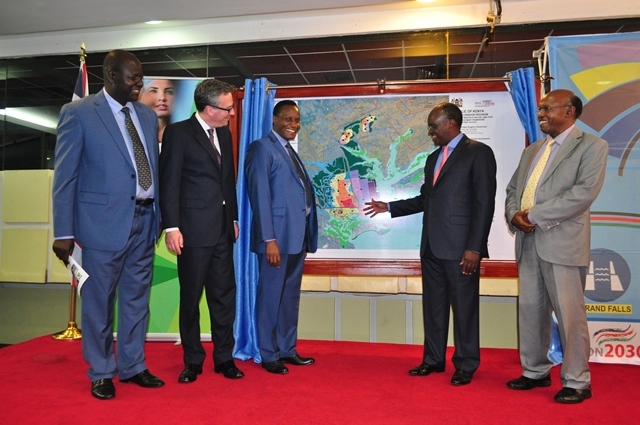 This will position Lamu County as a conducive Special Economic Zone being an ideal Freight Logistic hub an Industrial hub, Information-Communication and Technology park and a world class tourist and recreational Zone, driving forward the Country’s vision 2030 Economic vision of a sustained economic growth of 10% Per Annum. Lamu County is a place endowed with vast natural resources ranging from Fish and Livestock, Minerals, Natural energy sources, Wildlife, sandy beaches, Marine ecosystem and good weather greatly contributing to the social and economic livelihood of the County through crop production, livestock production, fisheries, tourism and mining. These natural resources available together with capable human resource and the envisioned Investment Infrastructure Development blended together, form the basic ingredients of the Country’s economic growth. The Lamu Integrated Investment Framework therefore provides a clear plan on how to harness and synergies these potentials to ensure sustainable development, leading to a vibrant economy. To support the development of the port and surrounding special economic zone (SEZ) so that Lamu can act as both a place where products are manufactured and as a hub for exporting and importing goods. Transform the national, regional and local economy by putting in place the right infrastructure and investment mechanisms to enable new economic sectors to thrive at Lamu. Establish Lamu as one of the major magnets for tourism in Kenya, by diversifying and increasing the tourist offers, and protecting and enhancing Lamu’s cultural heritage. Support communities in Lamu so that they can either continue with their existing livelihood or gain new skills to access the many new job opportunities that development of Lamu will offer. Develop the proposals for Lamu by fully engaging with the local community and other stakeholders, so that Lamu is developed in an inclusive way. Improve security in Lamu by improving the quality of life of existing residents and designing in a way that promotes inclusion and incorporating appropriate security measures. Lamu is being developed in a way that is inclusive so that it provides new employment opportunities and a better quality of life for both the existing population of Lamu and the Kenyans who come to make Lamu their new home. Protect Lamu’s natural assets including its marine and terrestrial habitats, its wildlife and landscapes, whilst enabling managed access to these areas for the local community and visitors to the area. Minimize impacts on the natural resources by developing urban areas in a green and compact way that promotes a mix of uses, efficient use of land, public transport and livability. Clean renewable energy sources as well as geothermal and Clean Coal energy sources will be set up to meet the growing energy demands of the Country and region as well as reducing the cost of energy and boosting efficiency. Lamu County being a UNESCO World Heritage Site, endowed by sandy beaches, wildlife and a favorable climate, is a popular tourist destination area. Riding on this advantage, complementing infrastructure such as Resort Cities, modern conferencing facilities and additional packages, will increase tourist traffic and longer stays by holiday makers. This will go a long way in aiding the Country’s tourism recovery plans. By facilitating Kenya’s industrial development agenda, the implementation of the Lamu Integrated Investment Plan is set to grow the micro, small medium and large industries, promoting value addition to raw materials, especially the agricultural-based produce. Value addition will be realized in the fishing industry, livestock and mining, responding well to Kenya’s Industrialization Policy. The development of the Lamu node is anticipated to generate a population of approximately 1,100,000 and accommodating 425,000 jobs when the area reaches the completion of the full development phase. It is also anticipated that a large proportion of the future population will be migrants to the area attracted by the job opportunities and facilities that the LAPSSET projects will offer. This is clearly a significant level of development, transforming the mainland area from its current state of limited development to a metropolis. Due to the envisioned migration to the county due to recreational, employment and economic opportunities, the construction industry will benefit immensely, providing housing and social infrastructure to cater for the growing population. The Lamu Port will play a key role in integrating Africa as the transshipment Port and gateway link to the East African Region. As a transshipment port, Lamu will serve the expanding import and export cargo base from the new industrial hinterlands of Northern Kenya, South Sudan and Ethiopia, overall enhancing regional and global commerce and trade. Additionally, by incorporating and implementing the Integrated National Maritime Policy (INMP), there are opportunities in ship/boat building and repair, marine aquaculture, Mari culture, maritime training, marine-based tourism, marine insurance, businesses and activities related to ports, port operations and relevant industries, shipping and logistics and commercial maritime support services. The Ministry of Lands and Physical Planning will ensure that the Lamu Integrated Investment plan is processed for approval and implementation to achieve the desired outcomes and to take the growth of Kenya’s economy to the double digit economic growth rate and middle income economy.